A Kauai doctor was charged in federal court yesterday after he allegedly prescribed pain-killers and other drugs to patients without conducting physical exams. 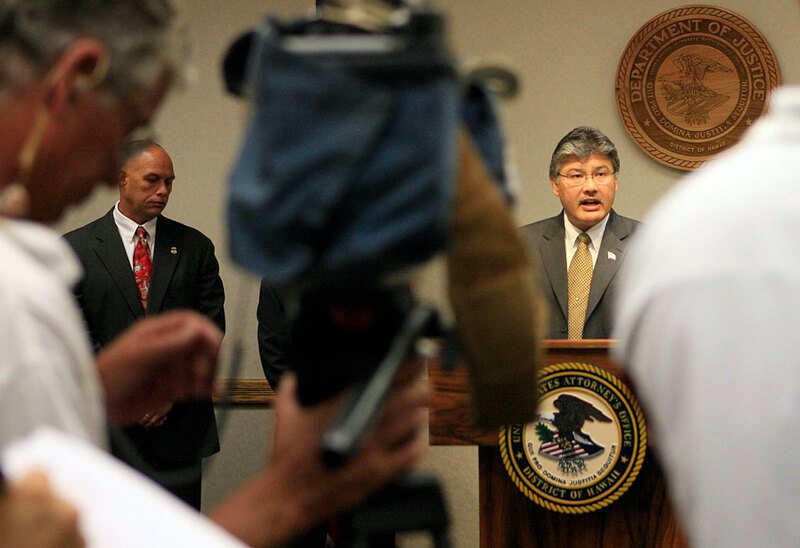 Dr. Harold C. Spear III, 54, was charged with "knowingly and intentionally distributing or dispensing a Schedule II dangerous drug" for no legitimate medical purpose, U.S. Attorney Ed Kubo told reporters yesterday. If convicted, he faces up to 20 years in prison. Spear made his initial court appearance before U.S. Magistrate Judge Leslie Kobayashi yesterday. He was released on a $50,000 unsecured bond and surrendered his Drug Enforcement Administration controlled-substance certificate. Spear's case is likely to go to trial next year, according to his attorney, Michael Green. Law enforcement in Hawaii initiated an investigation of Spear's activities in the state in March 2006 after a similar investigation was launched in Alabama. In the Hawaii investigation, Spear prescribed for an undercover agent 120 tablets of hydrocodone with guaifenesin in June 2006. Three weeks later, law enforcement executing a search warrant seized Spear's patient files dating to January 2003, financial statements, presigned blank prescriptions and documents relating to Spear's "dial-a-doc" business from his Hanapepe Clinic. Spear operates a Web site, www.dialadoc.net, where he states that prescriptions can be delivered to patients' homes or called in to a pharmacy through phone interviews and consultations with him instead of waiting a week for a doctor's appointment. Based on the seized files, Spear had prescribed 1,950 milligrams of oxycodone and 600 milligrams of methadone to a patient in April 2005 even though no physical exam was conducted, according to a court document. In May of that year, he prescribed another patient 240 milligrams of OxyContin and gradually increased the dosage despite a lack of pain assessment and scant documentation of physical exams by Spear. Spear was arrested Friday at his Hanapepe home. He risked the health and lives of his patients, many of whom he never met in person, Kubo said. "And by prescribing large amounts of those highly addictive drugs to others for compensation, Spear stopped becoming a medical doctor -- and simply became a common dope dealer." Countered Green: "This is someone who devoted his life to helping people." Spear's daughter, Leslie Spear, and hanai daughter, Rachel McLellan, described their father as an intelligent physician. "He had some patients for 20 years. He has taken care of families, a lot of people on Kauai," McLellan said outside federal court. Spear's daughters added that he travels to treat patients. He also speaks to longtime patients at length by phone and videophone about their medical problems. His preliminary hearing is scheduled for 10:30 a.m. June 25 before Kobayashi.